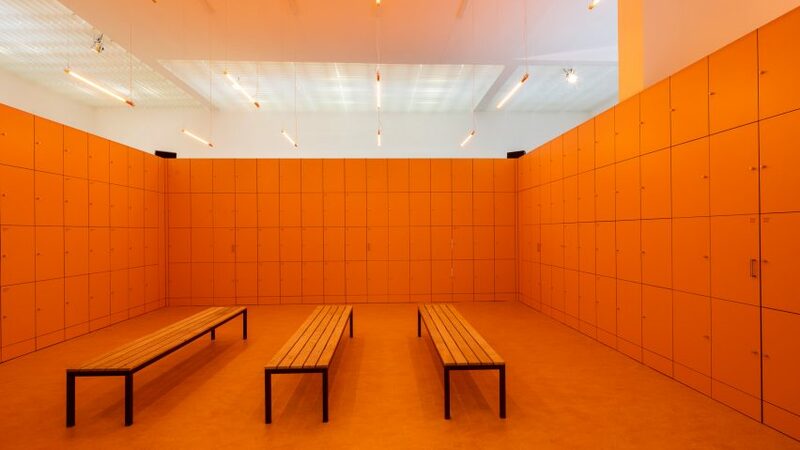 Orange lockers open to reveal secret rooms, windows, videos and images inside The Netherlands' Venice Biennale Pavilion, in an exhibition that explores the future of physical labour. The projects were selected by curator Marina Otero Verzier, director of research at Het Nieuwe Instituut, to show how humanity will be transformed in an age when robots are able to take on many jobs traditionally carried out by humans. "We're fascinated by these transformations of labour in the future, and also the transformations of architecture and the bodies that live in that architecture," explained Otero Verzier, who also features in Dezeen's new documentary film about drones, Elevation. "The pavilion charts a journey through these different spaces. On one hand they seem familiar and even banal, yet we think they are the core spaces to look at when we think about the future of labour and what our cities could be," she told Dezeen. Otero Verzier chose to create a locker room, as these spaces – found in most factories, offices and gyms – are places where people's bodies are changed, ready for physical activity. They are coloured orange, as this is the shade often used to symbolise the Netherlands. "The locker is the interface between this moment and these other different architectures," said Otero Verzier. "It's a space that is completely organised and compartmentalised. You have an egalitarian society but in some sense it is very constrained." Projects contained within the lockers cover a range of architectural typologies, encompassing offices, playgrounds, farms and factories, windows, beds, doors and virtual spaces. Some open up in clusters, creating enough space for doorways leading through to the hidden rooms beyond. In one of these hidden spaces, inflatable humanoid shapes in primary colours cavort on a bouncy chequerboard platform. The installation, by Simone C Niquille, looks at how digital avatars are used to measure safety for workers. Elewhere, Princeton University professor Beatriz Colomina has created an installation called Bed-In, which recreates the "fucktory" of John Lennon and Yoko Ono's bed in Room 902 of the Amsterdam Hilton Hotel. Her aim was to show how the bed is now a place of work as well as sleep. Another project sees Columbia University dean of architecture Mark Wigley revisit New Babylon, an artwork by Constant Nieuwenhuys, to reflect on the violence of robotised labour. There is also a room full of models, put together by Liam Young, which looks at how factory workers in India are sometimes behind the visions of future architecture released by western architecture studios. According to Otero Verzier, it is particularly important for architecture to engage with these issues at a "time when architecture itself is becoming automated". "What interests me is that most of the spaces we are analysing," she said. "Architects are mostly not present in the design, so somehow it seems that technology is faster than architecture." "So if we want to continue being a profession that is relevant in the transformation of cities, and be an active agent in making those decisions, we have to start being a part of the conversations." Also at this year’s biennale, the Nordic Pavilion has been filled with inflatable blobs that inflate and deflate in response to fluctuations in their surrounding environment, to symbolise how humans can create architecture in symbiosis with the environment. The Golden Lion for best pavilion went to the Swiss Pavilion, offers visitors an Alice in Wonderland-style experience as they venture through a replica show flat filled with both giant and tiny fixtures and fittings. The Venice Architecture Biennale 2018 opened to the public yesterday and continues until 25 November 2018.